In this exercise, you will perform a first basic electronic structure calculation to obtain the molecular orbitals (MOs) of Ethene: Your calculations will produce a list of occupied and non occupied MOs and a series of *.cube files, that allow the visualization of the orbitals with VMD. It is recommended to install and run VMD on your local machine. VMD can be downloaded free of charge after registering with your name and email address. To load and render the *.cube files on your local VMD you first have to transfer them from the server to your machine by using one of the transfer tools recommended on the First Login page. &MO_CUBES                 ! Controls which MOs are written to cube-files. &HF                      ! Hartree Fock exchange. In this case is 100% (no fraction specified). &SCREENING             ! Screening of the electronic repulsion up to the given threshold. Each cube-file contains the electronic density of one MO mapped onto a regular 3D-grid. Not all MOs were written to a cube-file, this is controlled by the PRINT_MO section. Their filenames tell you to which MO a cube-file belongs. For example ethene-WFN_00005_1-1_0.cube contains the 5th orbital. Finally set the Isovalue of to a reasonable value, eg. 0.1 . To visualize the positive and the negative part of an orbital simultaneously, you will have to add a third representation with a negative Isovalue, e.g. -0.1 . To give the two representations different colors, set their Coloring Method=ColorID and choose different ids. From the output: What are the energies of the Highest Occupied MO (HOMO), Lowest Unoccupied MO (LUMO), and the band-gap (in electronvolt)? Repeat the calculation for Propene and find again the HOMO, LUMO and band-gap energies. Lookup the molecular orbital diagram of Ethen to identify which MOs and therefore which cube files you need to open. 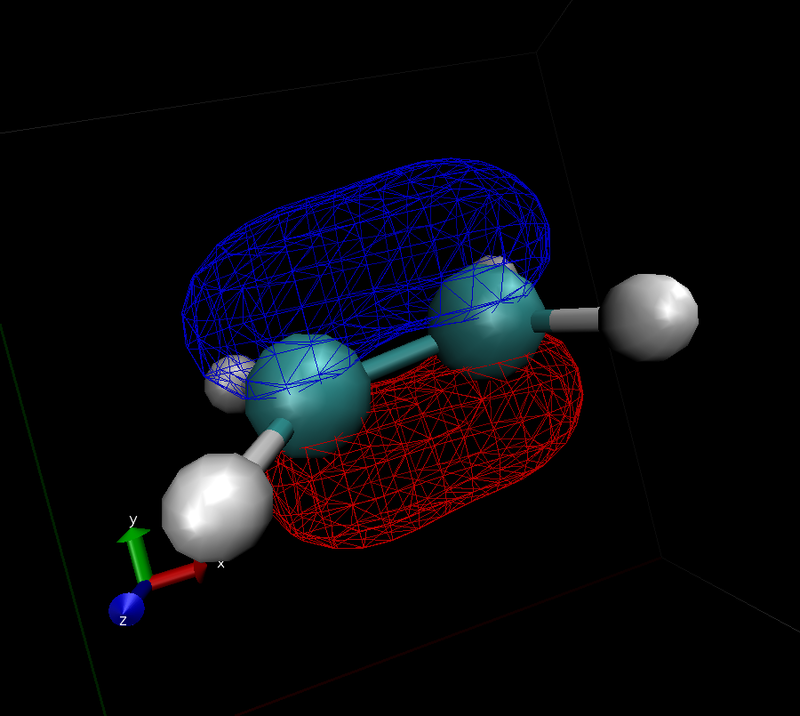 Use the Computational Chemistry Comparison and Benchmark DataBase to lookup the calculated geometry for Propene (CH2CHCH3), use the geometry optimized using a Hartree-Fock calculation and the 6-311+G(3df,2pd) basis set.